When a Data Definition has one or more Filtered Layers set, this allows the user to create a temporary layer on the map that will be removed when the map is reloaded. This layer will be created using the Filtered Layer as the template and will be filtered by the data contained in the results. This optional color can be used to override the Filtered Layer's default color. 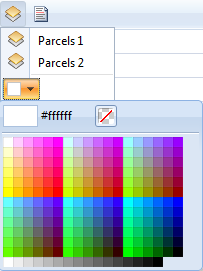 Note that because a Filtered Layer is using an existing layer as its template that it can contain any arbitrary styling (for example, a "Parcels 3" layer could be created that is already red).